Loss of endotracheal tube cuff pressure compromises secure airway and can increase aspiration risk. Common explanations for apparent endotracheal cuff pressure loss include tube migration after changes in patient positioning leading to partial extubation, cuff trauma from direct patient or laryngoscope contact, and product defects such as pilot balloon valve incompetency. This case illustrates an unexpected product defect in the pilot line of the Single Use ILMA-Fastrach™ (The Laryngeal Mask Airway Company, San Diego, California) silicone endotracheal tube. This is the first case report documenting this remediable defect, thereby addressing a meaningful airway device knowledge gap. A 31-year-old man with a BMI of 23 kg/m2 and no aspiration risk factors presented for incision and drainage of a right-hand abscess. Prior to intubation, silicone tube cuff patency was confirmed via brief air insufflation followed by rapid deflation, and the tube was lubricated and passed through the ILMA. General anesthesia was induced using fentanyl and propofol, followed by blind, facile first pass endotracheal intubation via the Single Use ILMA-Fastrach™. The silicone tube was secured at a depth of 25 cm at the ILMA airway tube 15-mm connector. The ILMA cuff was deflated after confirmation of consistent, spontaneous rhythmic end-tidal CO2 return. Shortly thereafter, diminishing inspiratory and expiratory tidal volumes led to suspicion of secure airway loss. Silicone tube inspection revealed inadequate pilot balloon insufflation refractory to attempted air re-inflation. Given bilateral breath sounds and unchanged tube depth, an endotracheal tube cuff leak was suspected. Since adequate oxygenation and ventilation were present, the decision was made to leave the silicone tube in situ. 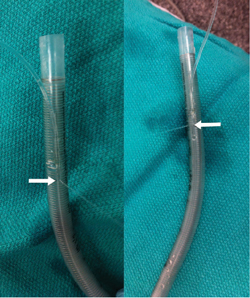 After uneventful completion of surgery and airway device removal, the silicone tube cuff was inflated with normal saline in an attempt to localize the cuff leak. A defect was noticed in the outer pilot line at the point where it invaginates into the endotracheal tube [Figure 1]. patency. Note that the pilot balloon cuff remains deflated. When attempting to localize the source of an endotracheal tube cuff leak, it is possible to overlook pilot line inspection given the rarity of such defects. Upon removal this pilot line defect was readily apparent by injecting saline into the pilot balloon. Had the pilot line leak been localized intraoperatively, various options would have existed to maintain cuff patency. For example, leakage from the pilot line defect could have been sealed using tape. This is possible with the ILMA silicone tube since it has an exterior pilot line that invaginates 26 cm distal from the endotracheal tube tip [Figure 2]. Note that this can readily be accomplished with the silicone tube remaining in the trachea. 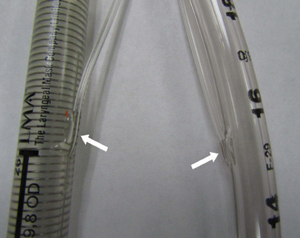 Alternatively, the defect could have been circumvented by inflating the cuff with normal saline [Figure 3]. In short, localization of the defect to the pilot line can circumvent endotracheal tube replacement with the intention of secure airway maintenance. The ILMA-Fastrach™ has been gaining popularity as a useful conduit for blind intubation in difficult airway situations. It is easy to use and exhibits high success rates of intubation on the first or second attempt, even with novice users.5,6 The endotracheal tube cuff, however, has been scrutinized for its high-pressure, low-volume design7,8 and the manufacturer admits there is no information regarding prolonged intubation with the included silicone tube. Given the location of the pilot line defect present in this case, it is possible that this is a vulnerable portion of the tube which is susceptible to damage. However, a search conducted using RASMAS software (Noblis Inc.,Virginia) did not detect any product recalls or notifications from the Federal Government. Per FDA policy, the manufacturer was informed of this potentially hazardous event. 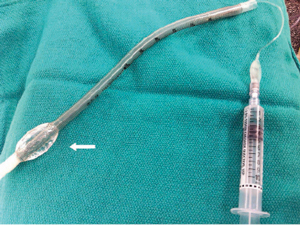 Figure 4 demonstrates pilot line invagination differences between the ILMA-Fastrach™ and a standard plastic endotracheal tube (Sheridan/CF® Endotracheal Tube, Hudson RCI®, California). In conclusion, this pilot line defect is easily detectable and repairable in situ, allowing for secure airway preservation and avoiding the risk of endotracheal tube exchange. Schubert A, Von Kaenel W, Ilyes L. A management option for leaking endotracheal tube cuffs: use of lidocaine jelly. J Clin Anesth 1991;3:26-31. Rudlof B, Lauterbach C. Intracuff saline infusion for the short-term repair of an endotracheal tube cuff leak. Anesthesiology 1999;90:1801. Ho AM, Contardi LH. What to do when an endotracheal tube cuff leaks. J Trauma 1996;40:486-7. 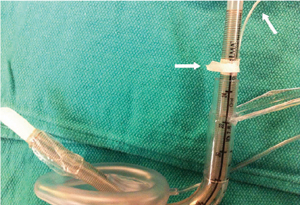 Sprung J, Bourke DL, Thomas P, Harrison C. Clever cure for an endotracheal tube cuff leak. Anesthesiology 1994;81:790-1. Aikins NL, Ganesh R, Springmann KE, Lunn JJ, Solis-Keus J. Difficult airway management and the novice physician. J Emerg Trauma Shock 2010;3:9-12. Wiesel S, Warm T. Fastrach uses a low-volume, high-pressure cuff for the endotracheal tube system. Anesthesiology 1999;91:592-5. Suneel PR, Koshy T, Unnikrishnan KP. High cuff pressure in the silicone endotracheal tube of the LMA-Fastrach: implications for patient safety. J Clin Anesth 2011;23:666-7.